The use of the word "dreamt" intrigues me, not least because their first Android phone (in fact, the first-ever Android phone, period) was called the Dream. Or the G1, when sold exclusively at T-Mobile. I'm willing to bet an awful lot of money (ok, approximately £5.15, which is what I have in cash in my jeans pocket), that this is the rumored G1 Blaze/HTC Vision, part of T-Mobile's "Project Emerald" Android release. Otherwise known as The Sequel To The G1 Phone, With A Slide-Out Qwerty Keypad. Otherwise known as the phone QWERTY fans such as myself have been waiting for for months now. What about the usage of the smoke, though? What could that mean? Or is it a Blaze? UPDATE 3: Someone asked me why I didn't mention the fact that it could be HTC's Windows Phone 7 phone. I didn't think it was likely at first—until I just remembered that it's already been announced by Microsoft that Europe will be seeing WP7 before any other countries, in October. 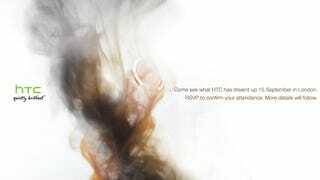 Considering HTC has only sent the invitation to UK-based media (from what I can gather), that could suggest a WP7 unveil. Then again, HTC has chosen to release Android phones in Europe first, well before the US.